Yasmina Benkhoui presents at last year's Graduate Research Innovation Exchange. Every year, the Graduate Research Innovation Exchange (GRIE) offers a glimpse into the range of WPI’s graduate-level research. 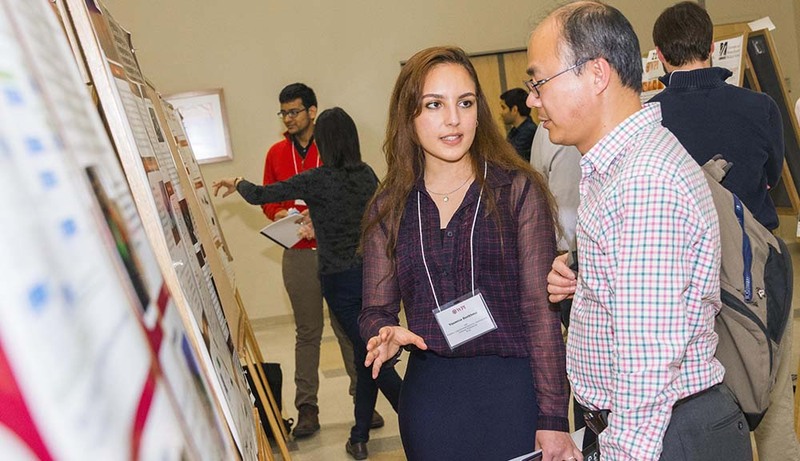 Two rounds of poster presentations celebrate the pioneering work grad students are doing and also allow students to practice essential professional development skills, like explaining their work in a way that just about anyone can understand. With posters explaining their work and a polished and succinct pitch to relay the information, 170 master’s and doctoral degree candidates will compete (February 6) for the 60 spots in the GRIE finals (April 9) and for the 20 final awards selected at the end of the day. Learning to shape technical and detailed research into a compelling story with a beginning, middle, and end isn’t easy, says Rory Flinn, director of graduate student professional development. But, he says, the ability to summarize work in a way that’s engaging to many audiences is crucial in the world where getting funding, attracting sponsors, or even hiring the best employees often depends on how compelling the story is. Some GRIE presenters are repeat presenters, others are doing this for the first time. “The presentations could even build on few years’ worth of work,” says Flinn. “Maybe the basis of the work is from a student who recently graduated but another student is now taking it over and taking it in a new direction.” And then it’s up to the new student to figure out how to weave all the pieces together. Being able to sum up work with few words that still make a lot of impact is valuable. Anyone who might write a grant in their careers will find this practice useful, but it extends into other areas. “No matter what they do in their careers, they will have to explain what they did in their work, explain the significance of their work, and be concise about that in layman’s terms,” says Flinn. Some programs are adapting a project-centric curriculum also at the graduate level, similar to the project work in the Interactive Qualifying Project (IQP) or the Major Qualifying Project (MQP) required of all WPI undergraduates. Known as the Graduate Qualifying Project (GQP), this project is a culminating capstone experience completed by a team of graduate students working on an authentic industry project where the results might immediately be put into use. From left, Zhaoning Su, Qing Xu, Emma Clavet, and Stephanie Okpoebo presented their data science GQP at last year’s GRIE. This year marks the third year of the Data Science GQP competition at the GRIE finals. For graduate students, a GQP provides students the firsthand experience to work on a team in a real-world setting on open-ended challenging problems. The GRIE experience ups the ante. “Students learn how to present their technical results in a storytelling way to a broad audience,” says director of the data science program and computer science professor Elke Rundensteiner. Students work as a team to present complex data science and analytics results in an engaging and thorough manner. “Our students are best served by training them while doing and working on impactful projects with industrial mentors that deeply care about the outcome of these projects,” says Rundensteiner, who works closely on the GQPs with the lead DS GQP coordinator (associate teaching professor of data science Fatemeh Emdad) and the GQP coordinator (assistant teaching professor Chun-Kit Ngan). The DS GQP structure is unique at WPI, Rundensteiner says, with the projects 100 percent sponsored by external organizations that as stakeholders benefit from the WPI student talent while concurrently providing a real-world experience to them. Professor Emdad believes the WPI DS GQP is distinct because it helps students take responsibility for leadership, work quality, deadlines, and project success. The sponsoring organizations who depend on the students’ results have high expectations. The GRIE presentation improves the “soft” professional skills sought after by employers. “We provide graduate students with an opportunity to practice and sharpen their communication skills as professionals both with their team and with their industrial mentors and project stakeholders,” says Rundensteiner. "Quite simply, organizations notice that." With so much taking place with GRIE this year, the excitement, and the preparation, will continue all spring. The events are also inspiring for the judges, often industry sponsors or alumni, who come to campus to engage with the presenters on their work.